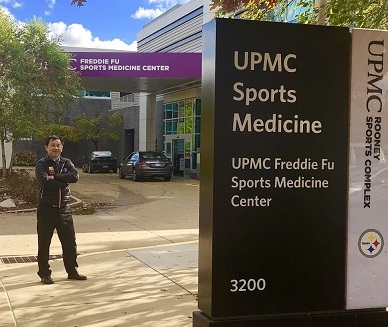 Dr. Fu founded UPMC’s sports medicine program in 1986. It was housed in a 1,500-square-foot suite in the Iroquois Building in Oakland. Under his leadership, UPMC Sports Medicine quickly grew to become one of the largest, most comprehensive clinical and research programs of its kind in the world, uniquely placing multiple specialists under one roof—including primary care sports medicine physicians, orthopaedic surgeons, physical therapists, athletic trainers, nutritionists, neuropsychologists and others—working together toward preventing and treating a full range of chronic and acute sports-related and non-sports-related injuries and conditions ranging from ankle sprains to knee ligament tears to concussions. As the first team physician for Mount Lebanon and Central Catholic High Schools in 1984, Dr. Fu spearheaded the first high school athletic trainer program in western Pennsylvania, a program that has grown into one of the largest in the country with 44 high schools, seven with onsite team physicians. In the same year, Dr. Fu became the company physician for Pittsburgh Ballet Theatre, a relationship that still exists today. In 2000, after outgrowing its second location at Baum Boulevard and North Craig Street, the center moved to a new 37,000-square-foot facility on Pittsburgh’s South Side in what is now the UPMC Rooney Sports Complex. Partly designed by Dr. Fu, the state-of-the-art complex houses the indoor and outdoor training facilities of the University of Pittsburgh Panthers and the Pittsburgh Steelers. For 32 years, Dr. Fu has served as the head team physician and orthopaedic surgeon for the University of Pittsburgh athletic department. He has been the David Silver Professor and chair of the Department of Orthopaedic Surgery at the University of Pittsburgh School of Medicine since 1997. He is also an affiliated faculty member of the McGowan Institute for Regenerative Medicine. Dr. Fu has worked momentously over the years to continue to set the bar higher not only for UPMC, but also for the rest of the world. He established the University of Pittsburgh’s Sports Medicine Fellowship Program, which attracts physicians from around the globe to learn surgical techniques and conduct research with Dr. Fu and his colleagues in the Department of Orthopaedic Surgery. Dr. Fu and his multi-specialty teams have built clinical excellence with evidence-based treatments, published in an endless number of scientific journals, setting a standard of care replicated by surgeons around the world. He is an author of more than 600 peer-reviewed articles and has made over 1,200 national and international presentations, co-authored 173 book chapters and edited 30 major orthopaedic textbooks. Dr. Fu’s intense work has helped revolutionize anterior cruciate ligament (ACL) reconstruction and he is extoled specifically for his relentless scientific research and clinical expertise in treating this injury, common in athletes of all ages and skill levels. His reputation has made the UPMC Sports Medicine program the destination of hope for Olympic, collegiate and professional athletes when their careers are in jeopardy and a marquis program for nonathletic patients who need treatment and rehabilitation to safely return to their life’s activities. In July 2016, Dr. Fu was inducted into the American Orthopaedic Society for Sports Medicine (AOSSM) Hall of Fame, selection into which is one of the Society’s highest honors with only a select few inductees named each year. In recognition, the council of the City of Pittsburgh dedicated September 13, 2016, to be Dr. Freddie Fu Day. Because of Dr. Fu’s medical achievements and their impact locally and internationally, along with his many contributions to enrich the Pittsburgh community, Pittsburgh Magazine named him one of the 100 most influential Pittsburghers of the 20th century in 1999. He is consistently listed in the magazine’s annual “Best Doctors” issue and has earned a place among Pittsburgh’s most beloved residents. Illustration: Dr. Fu poses near new building signage. UPMC.